This is the part where Skip-A-Turn gets to edmucate you with some gamer lingo. Now, when most people hear the term Munchkin they happily think of the little people from the classic The Wizard of Oz, but in Gamer lingo it’s not nearly that charming. A munchkin is a person who will manipulate, fudge, and fiddle in an RPG in order to make sure their character is perfect and flawless and can handle every thing thrown at them with out so much as a shrug. 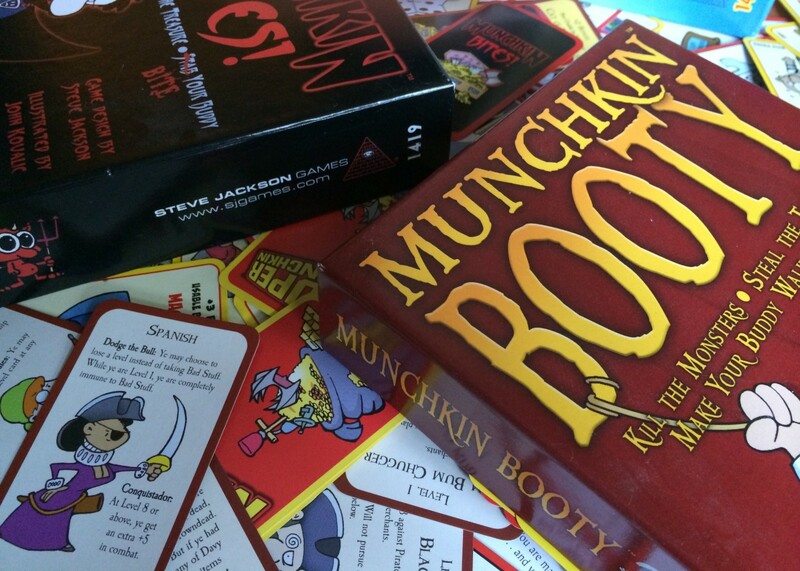 Steve Jackson Games created Munchkin in 2000 to gently make fun of this little sub-culture-of-a-sub-culture, by making a card game where EVERY ONE gets to play a munchkin. Since the game’s inception there have been over 50 spin-offs, expansions, and kinda-sequels featuring Pirates, Super Heroes, vague allusions to the World of Darkness, Conan the Barbarian, Axe Cop, and of course Cthulhu. If the gaming world were the Marvel universe, Munchkin would be Hydra. So as Munchkin has it’s roots in Dungeons and Dragons, it owes a lot of it’s game play to that. Each turn a player does their best Mr. T impersonation: You kick down the door to a new room of the dungeon, beat up the monster inside, and steal their crap. Rinse, repeat. Do we even need to caption this…? Each monster you kill gives you another level, and new equipment, which gives you pseudo-levels that makes fighting monsters about a million times easier: You can only defeat a monster if you beat it’s level, which is spelled out pretty clearly on the card. So it’s your level + your equipment > the monster = win. Look, we did math! Whoever makes it to level 10 first is the winner. Of course, it can never be that easy: Every time you fight a monster, other players can do things like make them Giant and give them +5, or Monstrous that give them ANOTHER +5, or maybe give them an evil twin to double the monster’s level. 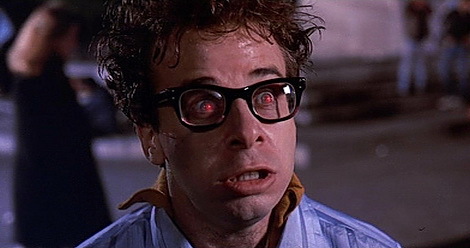 Hell, lets make it their Bar Mitzvah while we’re at it! +13 levels and you have to write them a lovely card! Of course, this will only happen after every one goes around the table, nervously turning over cards and hoping to get a level nine times. There are several factors as to why Skip-A-Turn doesn’t really like Munchkin. Like, at all. We’ll just focus on two major ones, though, as Buckle’s the smart one and I’m just the one who likes games too much. First off, the humor. Any version of Munchkin is a gigantic inside joke. Most people don’t know what a Munchkin is, and if you’re not in the “know” then it’s just a bunch of strange inside jokes. It doesn’t matter which version of the game you buy, because it’s the same humor in every product. At 14, you find this hilarious and awesome because it makes you feel like you’re part of this special inside club, but at 24 you realize it’s the equivalent of some one yelling “The Cake Is A Lie” at a convention: Not funny to those in the know, baffling to those who are not. This game is the guy at the comic/music/game/book store who feels the need to quiz you in order to see if you’re cool enough to shop at HIS store. The other problem is the game itself. Much like Kill Doctor Lucky a good part of the game boils down to Nuh-Uh-No-You-Didn’t at the last level. Seriously, levels one through eight are completely pointless because no one will even bother trying to screw you over until you’re about to win, and then it becomes a mad-dash to ruin your game. If you want a game where you get to be asses to each other, there are dozens on the market where you can do that, and unlike Munchkin you’ll actually be playing a game instead of flipping over cards and realizing several years later that some of the jokes are just… Really chauvinistically juvenile. If you want a Steve Jackson designed game of humor and shenanigans, check out Chez Geek instead. It’s a little harder to find, but it’s way more amusing, fun, and fast-paced. Also it won’t make you sheepishly try to explain away some of the jokes like you’re dealing with a racist grandmother. Skip-A-Turn Variation: Sunday Morning Comics: Try to find worse puns than the ones on the cards. Get a level each time you make the whole table groan. This Post was posted in Card Game Reviews and tagged Axe Cop, board game review, card game review, Cthulhu, humor, Muchkin Review, Munchkin, review, Skip-A-Turn, skipaturn, Steve Jackson Games. Bookmark the permalink. Aw, thank you! We’ll be including our little thank-you-acceptance bit in the next review 🙂 NBI was a great program, and I’m thrilled that we have done it.